Mallory Miller, a member of the Fairfield High School Tribal Tribune staff, also known as the journalism class, spent time with the cast and crew working on the school's spring musical 'Fiddler on the Roof.' Click the headline above to read more of Mallory's work and to view her photos. 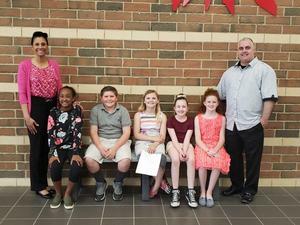 The quick thinking of Kim Witt, a teacher at Fairfield Creekside Middle School, helped save the life of a student who was choking while in her class. Her training in the Heimlich Maneuver was put to the test with a positive result. 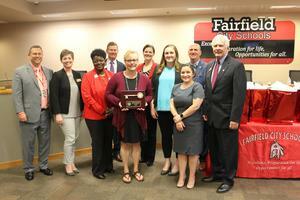 Witt was recognized by the Fairfield Board of Education at the April 18 meeting and presented a “Key to the District” by Superintendent Billy Smith. She is shown here with the award with (left to right) Smith, Board Members Carrie O’Neal, Balena Shorter, Brian Begley, Creekside Principal Kari Franchini, Assistant Principal Cassandra Delaney, Assistant Principal Elyse Parker, Board President Michael Berding, and Board Vice President Dan Hare. Congratulations to Heather Tash for being approved by the Fairfield Board of Education to be the new assistant principal at Crossroads Middle School beginning with the 2019-20 school year. She is currently a health teacher at Creekside Middle and brings more than 10 years of experience in the classroom. The board also approved a recommendation to name Aaron Blankenship the new athletic director. He will replace Mark Harden, who resigns effective June 30 to accept a similar position in another district. Aaron is currently an assistant principal at the high school, and had previously taught social studies and was dean of students at the Academy. Additionally, the board approved a recommendation to name Darren DJ Wyrick head coach of the varsity boys basketball team for the 2019-2020 season. He replaces Jeff Sims, who recently resigned. DJ comes to us from Vandalia-Butler High School. We welcome DJ to Fairfield! Great job to the members of the student council at North Elementary for their presentation at tonight’s school board meeting. 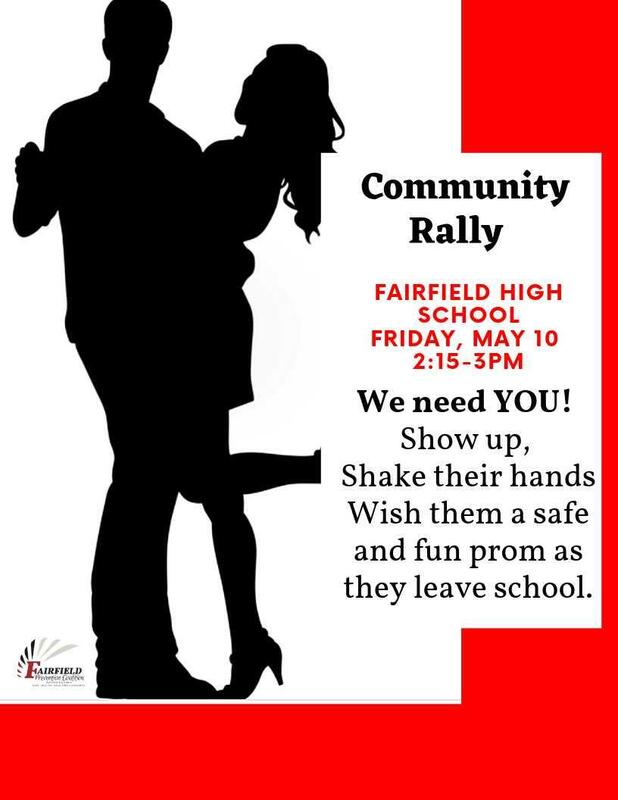 They are truly making North a better place and preparing themselves to be future leaders and positive citizens of Fairfield! Celebrate the FCSD Fine Arts at Cinco de Mayo Arts Fiesta 2019 May 5! It's almost time for the FCSD Arts Fair! Join us for the 57th showcase of our fine arts programs on Sunday, May 5 from 1-5 p.m. at Fairfield High School and Fairfield Freshman School. This year's theme? "Cinco de Mayo Arts Fiesta!" Come celebrate with us. Admission is Free! Click the headline to view performance schedule and more details. FHS Drama and Music Departments Present "Fiddler on the Roof"
The FHS Drama Department is hard at work preparing for the upcoming Spring musical, the Broadway classic, Fiddler on the Roof. Set in the little village of Anatevka, the story centers on Tevye, a poor milkman, and his five daughters who struggle to balance traditions and desires in a changing world. With the help of a colorful and tight-knit Jewish community, Tevye tries to protect his daughters and instill them with traditional values in the face of changing social mores and the growing anti-Semitism of Czarist Russia. Fairfield alumnus Maiya Caldwell has returned to choreograph the musical numbers which are impressive. She has kept true to the traditions of the original Broadway production while bringing a youthful and unique perspective to many of the dance moves. The show is more than 50 years old, but Reed has managed to bring a fresh feeling to the timeless tale. Tickets are on sale now for $10, by clicking the link below, or will be available at the door for $15. Show times are Thursday, April 25 through Saturday, April 27 at 7:00 PM and Sunday, April 28 at 2:00 PM.